SNHR has released its monthly report on the use of barrel bombs by Syrian regime forces for September. The report notes that the Syrian regime has used improvised, low-cost, highly-effective weapons in order to kill as many victims as possible and inflict as much wide destruction as possible. Barrel bombs have been one of the most-used improvised weapons since March 2011. The first documented barrel bomb attack, according to the report, was on July 18, 2012 in Dael city, northern Daraa governorate, where five civilians were killed in that attack, including one female child and three women while about eight others were injured. The report adds that it took the Security Council about a year and a half to adopt resolution 2139 on February 22, 2014, which condemned the use of barrel bombs, However, the Syrian regime is still raining down the areas outside of its control with tens of barrel bombs. The report says that Syrian regime forces have used 26,577 barrel bombs since the start of the Russian intervention on September 30, 2015, despite the promises made by Vitaly Churkin, the former Russian representative to the United Nations, in October 2015 where he said that the Syrian regime would stop bombing with barrel bombs. The report sheds light on the nature of barrel bombs, the methods adopted by the Syrian regime to manufacture them, the types of containers and explosive materials used by the Syrian regime, and the chemical substances, incendiary ammunitions, and metal objects that are added to barrel bombs. This report draws upon the ongoing monitoring of news and development and on accounts by survivors, eyewitnesses, and local media activists as the report contains one account collected through speaking directly to eyewitnesses, and are not cite from any open sources, in addition to analyzing a large number of videos and photos that were posted online or sent by local activists. According to the report, September saw a military escalation by Russian-Syrian alliance forces in north Syria that lasted from September 4 until September 11, during which barrel bombs were used by the Syrian regime to terrorize civilians. The report adds that the Syrian regime used barrel bombs loaded with anti-tank mines in September. This was in al Habeit village, southern suburbs of Idlib on September 10. The report stresses that the Syrian government has violated Security Council resolutions 2139 and 2254, and used barrel bombs in a systematic, widespread manner. Also, the Syrian government, through the crime of willful killing, has violated Article 7 and Article 8 of Rome Statute. In addition, the Syrian government has violated the rules of the international human rights law which guarantee the right to life. Considering that these violations were committed in a non-international armed conflict, they qualify as a war crime. The report notes that barrel bomb attacks are an indiscriminate bombing that targeted defenseless civilians and caused significant damages to protected objects. The damage was too excessive compared to the anticipated military benefit. According to the report, Through the use of poison gases-loaded barrel bombs, the Syrian regime has violated the rules of the customary international humanitarian law. Secondly, the Syrian regime has violated the CWC treaty. Thirdly, the Syrian regime has violated all relevant Security Council resolutions – particularly 2118, 2209, and 2235. In addition, the use of chemical weapons constitutes a war crime according to ICC’s Rome Statute. 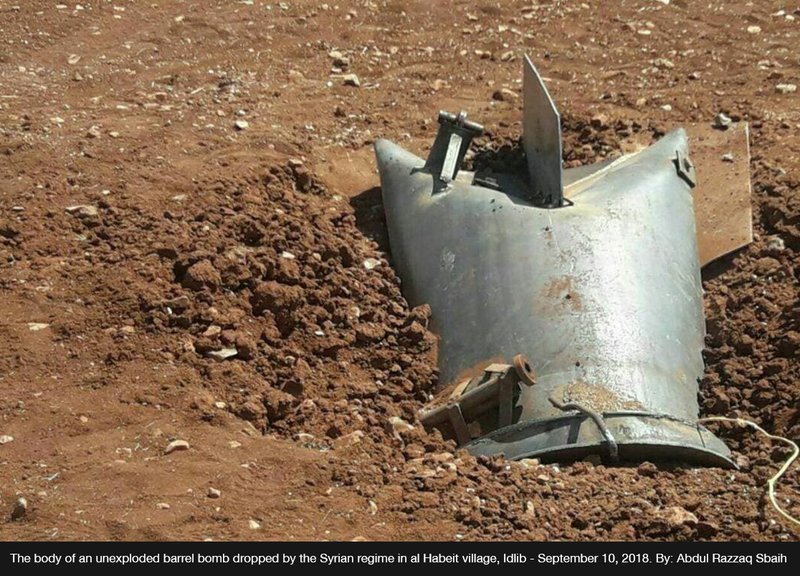 The report notes that Syrian regime forces have used barrel bombs loaded with incendiary ammunitions without a military justification, and without taking any measures to reduce the damages to civilians and civilian facilities. The report calls on the Syrian regime to stop treating the Syrian state as a private family property. In addition, the report calls on the Syrian regime to cease terrorizing the Syrian people by dropping barrel bombs, shoulder all legal and material consequences, and compensate the victims and their families from the resources of the Syrian state. The report calls on the Security Council to ensure the serious implementation of its resolutions. Also, the report calls on the four permanent state members to apply pressure on the Russian government to cease its support for the Syrian regime, while the report adds that an arms embargo should be imposed on the Syrian regime. In addition, the report emphasizes that the case in Syria should be referred to the International Criminal Court, peace and security should be instilled in Syria, and the prosecution of everyone involved in crimes against humanity and war crimes should commence immediately. In addition, the report says that pressure should be applied on the Syria government to ratify Protocol III of the Convention on Certain Conventional Weapons, and pressure the Syrian government to comply with the Protocol’s restrictions. In addition, the report calls for the implementation of the “Responsibility to Protect (R2P)” norm, especially after all political channels have been consumed through the Arab League and then Mr. Kofi Annan’s plan, and the Cessation of Hostilities statements and Astana agreements that followed. The report stresses that action should be taken under Chapter VII of the Charter of the United Nations, and the “Responsibility to Protect” norm, which was established by the United Nations General Assembly, should be implemented. The Security Council is still hindering the protection of civilians in Syria.